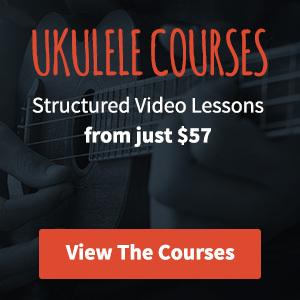 Once you’ve gotten a few chords under your belt and started to get to grips with strumming your ukulele one of the next things you will probably want to do is learn how to sing and play ukulele at the same time. The good news is it’s not that difficult all it takes is a little practice. You’ll find it a hell of a lot easier if you start with a song that you know inside out. Pick a song that you know by heart as you’re going to need that knowledge to help you through. Here’s the method that I use when I’m learning to sing and play a song for the first time. I don’t always need to go through all the steps below, the more you practice the more natural it becomes. Sometimes I can jump straight in at step 4, other times it’s more difficult – it depends on the song. You may know the song really well, but listen to it again. Then do it again, and again. Really get it drilled into your brain. Try and listen for the chord changes and make mental (or written notes) where the chord changes come in relation to the lyrics. Simplify the strumming pattern, and when I say simplify, I really mean it. To begin with you’re only going to be playing one down strum per bar. If the chord changes from one bar to the next then great, if it doesn’t just play another down strum of the same chord. Try and sing along with your simplified strum version of the song, this should be quite easy as you only really need to work out what lyric you should be for each down strum. This will really help you get to grips with the structure of the song and will provide a solid start point for you to move on from. Now you can sing and play the song with a single down strum per bar, try and add a second down strum per bar so you’re strumming on beats 1 and 3 (assuming you’re playing a sing with 4/4 timing). Once you get that one covered, increase to 4 down strums per bar. When you can do this, you’re almost there! Go slowly to begin with, you don’t need to be fast, you only need to be consistent. If you’ve gotten this far then there’s no turning back now. You’ve successfully managed to sing through your song of choice with a strum pattern that involves both up and down strums. All you need to do now is tweak the strumming pattern to work with the song. Quite often when I’m singing and playing I’ll use a more simplified pattern than when I’m just playing to make it a little bit easier on myself – this is where the most useful strumming pattern you’ll ever learn comes in very handy. That’s it! You’ve done it. Give yourself a high five and cross that one off your list. If you’re still struggling then go through the steps above very slowly – don’t be tempted to skip through them as each one prepares you for the next step you’re going to take. It takes time to learn but stick it it, once you’ve got it in, it stays and it’s a great skill to have, even if you’ve got a terrible singing voice (like me).